The regular suppers, which were founded by four Philadelphian women in 2016, aims to educate and advocate for immigrants’ rights. 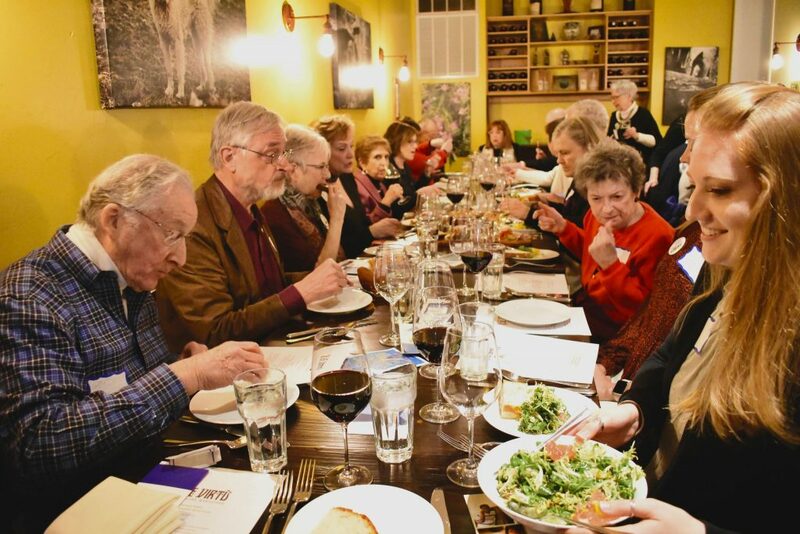 Dozens of foodies from around Philadelphia broke bread at the acclaimed Le Virtù on East Passyunk this week. But the gourmet menu served more than authentic Abruzzo delights. Somewhere amidst the bruschette e antipasti and tagliatelle con gamberini, conversations surfaced about the struggles and solutions surrounding immigration in the United States. On Wednesday, Sanctuary Suppers, a local group founded a few years ago by four Philadelphia women, hosted its 11th benefit dinner at the South Philadelphia business nestled on restaurant row. Funds from the event, which was attended by more than 70 people, including Mayor Jim Kenney, Councilwoman Helen Gym and state Rep. Joe Hohenstein, supported the Philadelphia-based Nationalities Service Center, which provides a scope of services to immigrants and refugees migrating to the United States from nearly every corner of the world. Founded shortly after the 2016 presidential elections, Sanctuary Suppers, which are held in various immigrant-owned restaurants around Philadelphia every six weeks, benefit a different organization each time and have given more than $24,000 to the immigrant community to date, according to its website. New restaurants are simply chosen as Sesker and co-founders Jonne Smith, Marcia Kung and Linda Hoffman meet for lunch dates around the city. Every supper, which features a few speakers experiencing present realities of immigration, highlights a new culture while also partnering with a new community organization. For the first time, a supper was held at an Italian restaurant. Setting it apart from previous dinners, this meal was more politically charged than most, as the event was presented in collaboration with Protect & Elect – a local organization that works to elect candidates who represent and protect democratic values, committing themselves to the rights of individuals by practicing equitable policies. For Protect & Elect, which endorsed Hohenstein during the evening, the supper was an opportunity to spread its mission. “This is just another opportunity to be a part of a community that cares about democracy, and so that’s why we’re here – to support them and to work together, because collaboration increases impact,” said Marilyn Frank who is on the leadership team of Protect & Elect. Most dinners, which have been held at a slew of ethnic eateries from Ethiopian restaurant Abyssinia to Szechuan restaurant Han Dynasty, see a turnout of 60 to 70 people. Averaging $60 to $70 per ticket, Sesker says half the cost goes toward the restaurant with the other half going toward the chosen organization. While this was many individuals’ first supper, including Kenney, some folks say they’ve frequented the events several times. 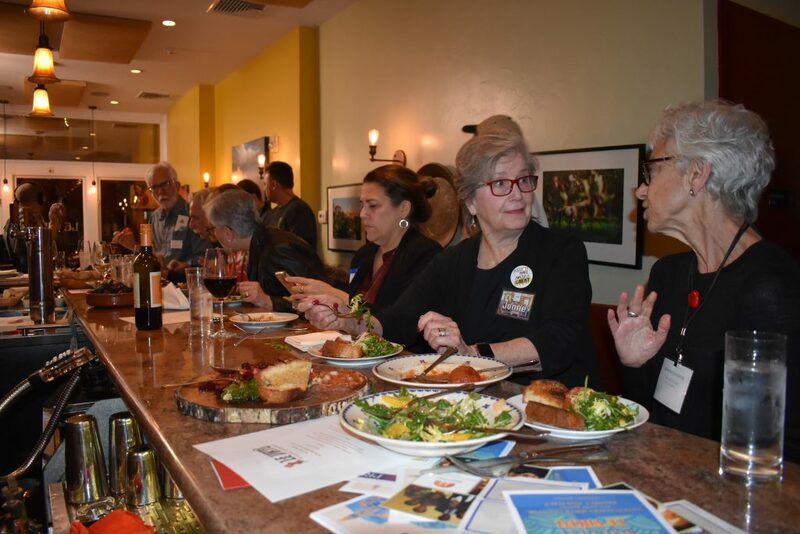 Dinner guest Dianne Reed, who has attended a few of these suppers, says she keeps returning for two reasons – the immigration advocacy and, of course, the food. “I think it’s brilliant of the organizers to combine the two, especially at a great place like Le Virtù,” she said. The award-winning Le Virtù, which was opened on East Passyunk in October 2007 by Francis Cratil-Cretarola, was specifically chosen because of its open advocacy for immigrants. Cretarola, who is a third-generation Italian-American, recalls the discrimination his grandfather experienced after immigrating to the United States from Abruzzo in 1909. Searching for steady work and housing, his grandfather struggled with social acceptance in an era when Italians immigrant were viewed as second-class citizens. For Cratil-Cretarola, Sanctuary Suppers aligns with his own activism, as he often draws parallels between the prejudice his grandfather faced and the current headlines surrounding newcomers from Latin America, Asia and other nations. Like his own lineage more than a century ago, immigrants today, Cratil-Cretarola says, are seeking the same welfare, including finding opportunities and creating a better life for their families.